Tucked into the vast Green Swamp, just inside the Sumter County line, this state-of-the-art fish hatchery and research facility might seem an unlikely birding spot. Instead, its 60-plus ponds offer a begrudging buffet to wading birds like Great Blue, Little Blue and Tricolored Herons, Black-crowned Night-Herons, Snowy Egrets and a number of wintering shorebirds. Sandhill Cranes trumpet overhead, and the bordering forest shelters songbirds such as Brown-headed Nuthatches, Eastern Bluebirds and Summer Tanagers. 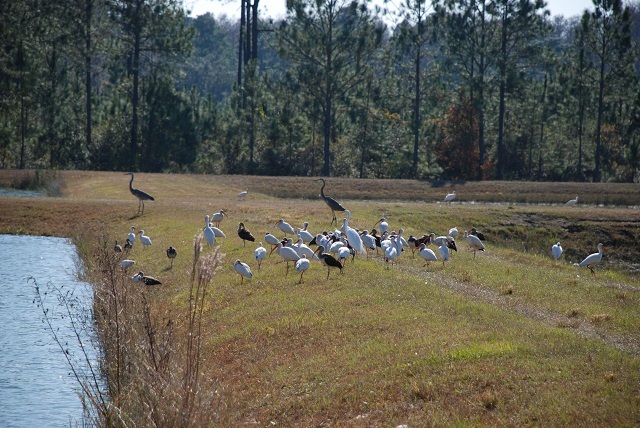 Watch the shallow ponds for Wood Storks and Limpkins, and the entrance road for Osceola Wild Turkeys, which are slightly smaller and darker (and a little more skittish) than their eastern cousins. Northern Rough-winged Swallows and Tree Swallows perform acrobatic displays over the ponds as they pursue insect prey. Look for dragonflies such as swamp darner and great blue skimmer. Take time to enjoy the impressive display aquarium; an overlook for watching fish production activities is also provided. Please call ahead to schedule group outings or student field trips. This site was formerly known as the Richloam State Fish Hatchery.